I did the cake when the hubby was out at work.. I did air the house and place charcoal everywhere to absorb the smell.. We had the cake after dinner and dad was pleased.. He enjoyed the cake and it sure made it all worthwhile :) I was really generous with the durian.. YUMS! 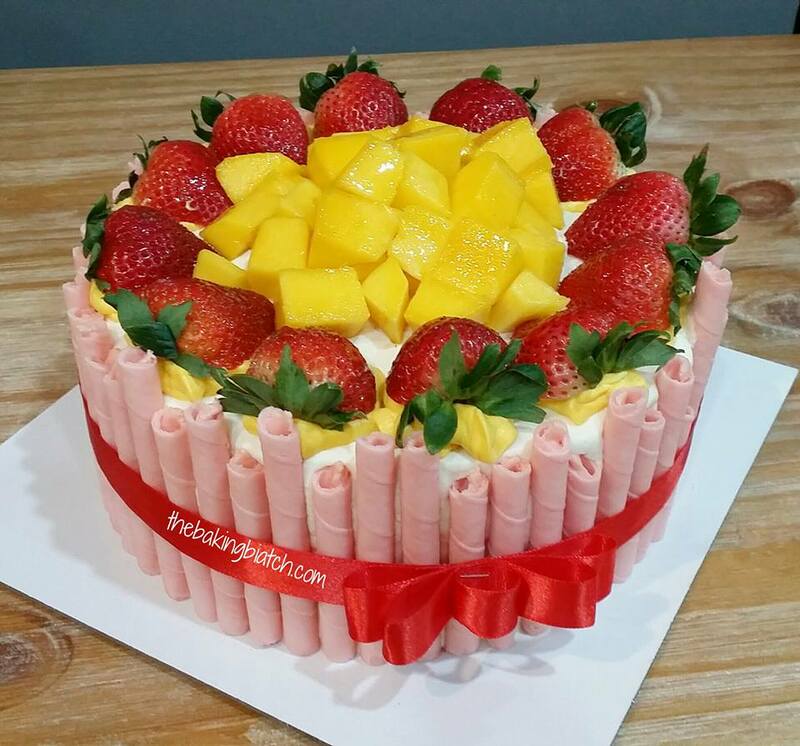 I wanted to decorate the cake with durian but it wouldn't be pretty unless I did it durian-in-shell style.. so I decorated it with some fresh strawberries, mangoes and strawberry sticks. This recipe yields a 9" cake and takes about 2.5 hours to bake. I'd rate it a difficulty level 3 out of 5. 1. Prepare sponge cake according to the method in this recipe. 3. Slice into 3 layers/slices. 5. Whisk whipping cream till stiff peaks. I used non-dairy so it'd last longer outside as I had to travel with it..
6. Double boil water and gelatin till gelatin has dissolved. Allow mixture to cool to room temperature. 7. Remove seeds from durians. 8. Add durian pulp and gelatin mixture to mixing bowl with whipping cream and whisk on slow speed till well combined. 9. Fold mixture if required as durian pulp maybe too thick. 10. 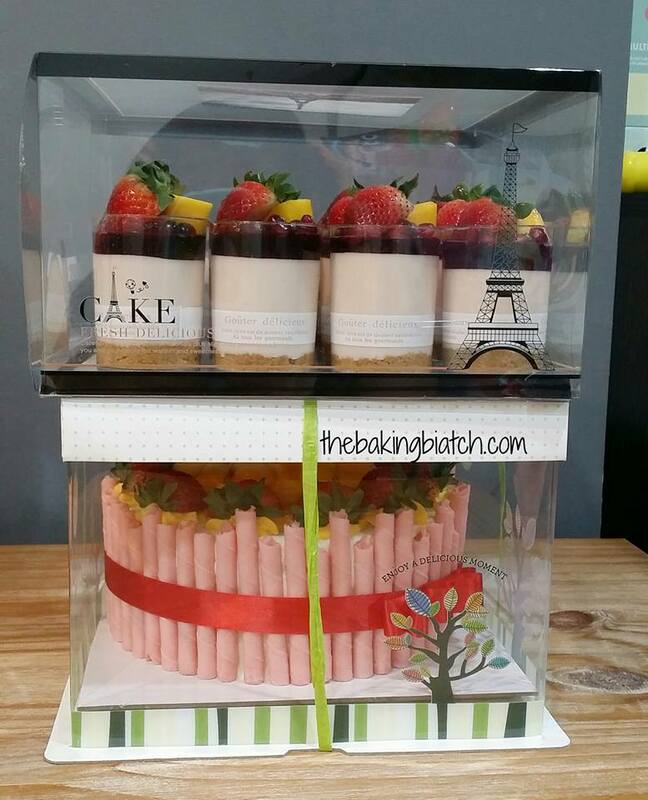 Assemble cake by starting with 1 layer of cake on cake board. 11. Spray cake with some sugar solution to keep the cake moist for a longer time. 12. Spread a layer of durian mousse on the first layer. 13. Repeat steps for 2nd layer. 15. Allow cake to set for 15 minutes in the refrigerator. 16. Break Rendono strawberry sticks in half. 17. Wash, halve and dry strawberries. 20. Colour (optional) the small portion of durian mousse and pipe 12 dollops on the top of the cake. I used Wilton 1M tip for a small star. 21. Place strawberries on the durian mousse that were just piped. 22. 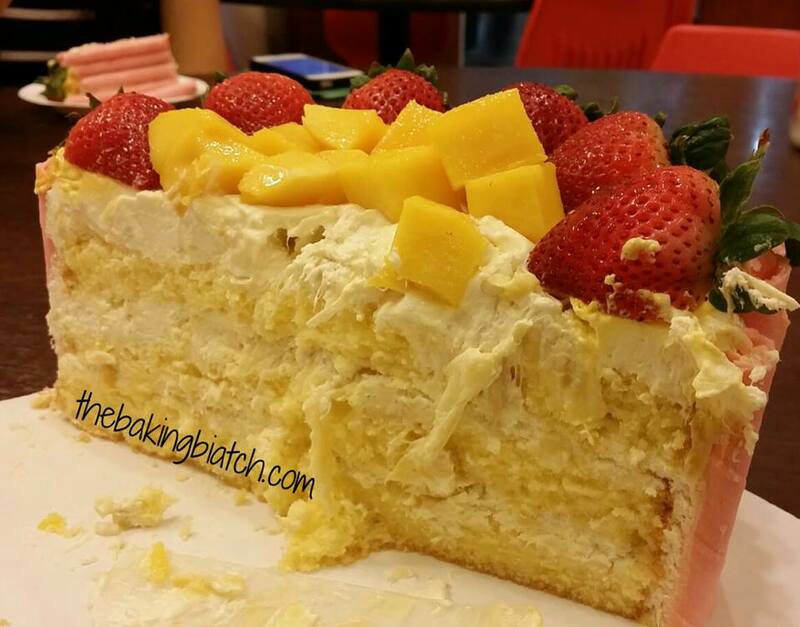 Top cake with cubed mango. 23. Brush on a thin layer of apricot jam on the fruits to add shine/keep fruits fresh. If the apricot jam is too thick, thin it with a small bit of water. How much whipping cream is needed for frosting? Hi, for frosting the cake? 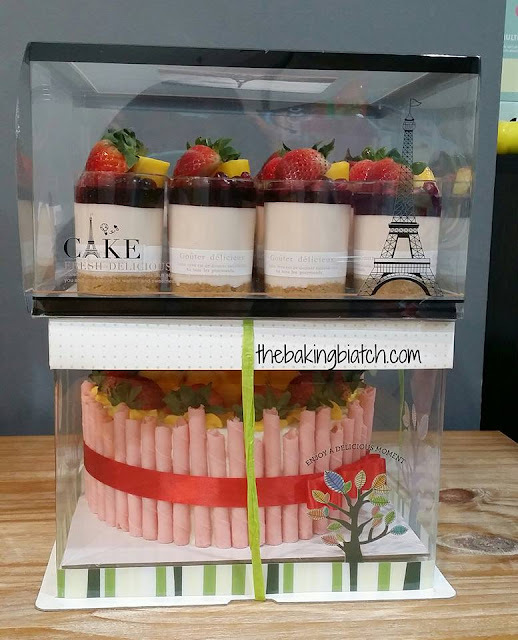 The amount indicated in recipe is sufficient to frost layers and cake. hello! Bake it for about 30 mins.. then check if the cake is done.. it is if the surface is dry and that a toothpick comes out clean from the middle of the cake..
Hi Cynthia may i know where to find non-dairy whipping cream in Singapore? hello Mion, baking shops like PH and some cold storages do sell them. Hi babe! Can i know how long can i store this cake at room temperature for? hello, i'd say a maximum of 30 mins.. it should be chilled.